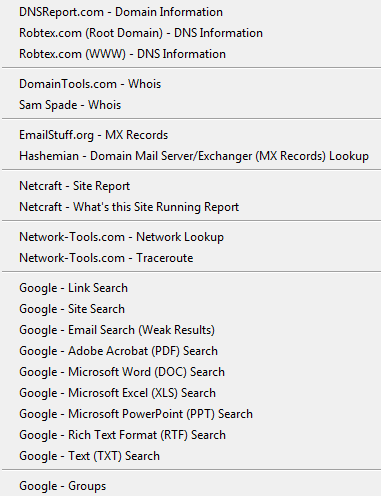 Based on Gina Trapani's About This Site Firefox Plugin (https://addons.mozilla.org/en-US/firefox/addon/3673), Passive Recon allows Information Security professionals the ability to perform "packetless" discovery of target resources utilising publicly available information. In addition multiple googlehacks can be performed. Selecting the ShowAll option at the bottom opens each search in a separate tab (Better have broadband, that's a lot of tabs and your browser will get very clouded). Simply clicking on the selected menu provides a wealth of information saving the tester the trouble of visiting the repository they would normally go next to obtain this from. Note: - DNSReport links to DNSStuff which requires an account for more intensive searches. A link to use CentralOps for querying Domain and Email Dossiers etc.